Recalling the previous post, we need to remember that the tread should be relaxed, initially falling on the ball of the foot with knee and hip slightly bent, then let the heel down under control of the calf muscles while our body moves forward and passes over our foot. This stretches the Achilles tendon and plantar fascia (eccentric load) and stores energy for the take-off phase. It is very similar to the kind of stride you do when you run backwards. The best way to find the right stride is temporarily removing the shoes. Find a hard, flat surface and run on it. Then put on your shoes again. Initially you can continue with your conventional running shoes but, if you definitely change your style, you may want to change to minimalist running shoes. 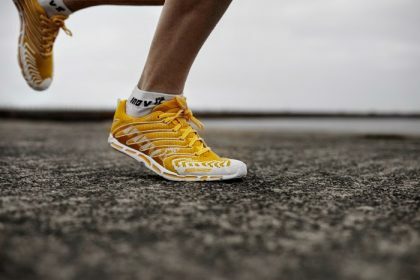 They are more flexible, lighter, have no arch support neither built-up heel, allowing your heel to go lower and stretching more your Achilles tendon, because the shoe will not contact with the ground so early. In order to avoid injuries to the Achilles tendon it is very important to allow contact of the heel with the ground. If we run exclusively on the forefoot, as sprinters do, we will result most likely injured. Keep in mind that we will exercise muscles and increase the load on regions that so far we have not used too much, so we’ll have to stretch, massage, and listen to our bodies instead of following the high demands of our mind. Lots of people going to the doctor do it because they only listen to their goals and forget to listen to their bodies. So, train, but listen to yourself rather than saying “no pain no gain”. It is important to spend the first 10-15 days walking barefoot at home, doing foot massages, etc. in order to get aware of your feet again because we have long used them only as a support for shoes. The key to avoid getting injured during the transition is not to overload the structures. Therefore you have to start with very little load (0.5-1.5 km) and increase weekly at a rate of approximately 10%. We should run every second day at most, not every day. Above we have an example table with a weekly increase of 10%. Starting from 1 km the first week it will take us six months (26 weeks) to reach 10 km. If we are already running and we don’t want to lose physical condition we must combine both forms of running. But beware, if you are running 10 km, increasing to 10% of forefoot running weekly increase does not mean making 1 km more per week but increasing only 10% of what we did last week with the new technique. The next table shows it.